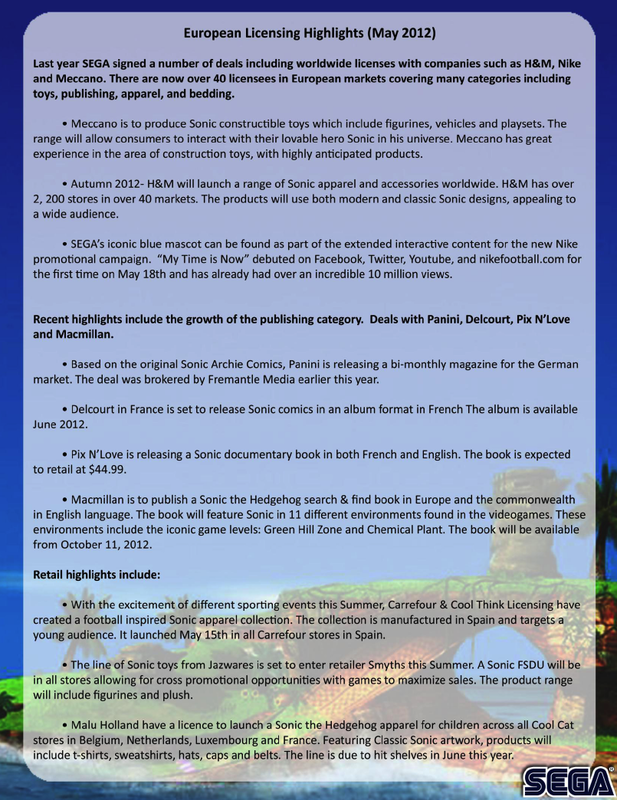 Following up on the confirmation of ASR Transformed coming to mobile devices that we brought you first in a bulletin, those same documents from the Las Vegas Licensing Expo confirm a $45 price point for Pix’N Love’s Sonic History book. You can see this being part of a larger licensing strategy for Sega that includes apparel, search and find books, localized Archie Sonic Comics for Europe, and more. All told, more than 40 licensees are on board with Sonic merchandise. But that $45 price sticks out, as to this point the English translation has only been confirmed for Britain. Even there, no release date has been solidified. But why would Sega peg a price point in American dollars if it wasn’t coming to the states? We’ll try and seek clarification. There is more to these documents–though nothing terribly earth-shattering like you may have heard–so we’ll cover the remaining tidbits from Sega’s Las Vegas Licensing Expo releases on Thursday.